Less than a year after voters in Oklahoma legalized medical cannabis, more than 35,000 residents have a medical patient license. Today, Oklahoma’s medical marijuana scene is growing rapidly, propping up a multi-million dollar industry. Business might be booming, but running a successful cannabis dispensary in Oklahoma takes more than getting customers in the door. For those interested in how to open a medical cannabis dispensary in Oklahoma or those who are already up and running, you need to understand compliance requirements. Before we dive into tips for running a compliant medical marijuana dispensary in Oklahoma, let’s start with the basics. Here’s a quick rundown of important rules and regulations for medical marijuana in Oklahoma. For a more complete summary, keep track of our Oklahoma dispensary laws page. The Oklahoma Medical Marijuana Authority (OMMA), a division of the Oklahoma Department of Health, is in charge of medical marijuana licensing, from patients to dispensary owners. If you want to open a dispensary in Oklahoma, you’ll apply with the OMMA system. Doctors may recommend cannabis to patients for any condition they deem appropriate, allowing for a wide pool of potential patients. Individuals must be registered with the state as a medical marijuana patient or caregiver to shop at dispensaries legally. Oklahoma medical marijuana dispensaries can sell mature plants, seedlings, concentrates, cured cannabis flower, and edibles. As of now, Oklahoma is not capping the number of cannabis business licenses available. Compliance errors result in major penalties. A first offense comes with a $5,000 fine and a second offense (in a two-year period) will lead to license revocation. Seed-to-sale tracking is a vital component of any legal cannabis industry. Oklahoma requires all commercial cannabis licensees utilize an inventory management system and produce monthly reports. With a two-strike policy in place, a casual approach to compliance can quickly cost Oklahoma dispensaries their license to operate. To help make inventory management and reporting easier than ever, find a technology partner that understands your day-to-day business needs. Cova’s inventory management system tracks transactions and inventory in real-time and can generate monthly OMMA reports in just a few clicks. 72 ounces of edible cannabis. And considering what happened to a major dispensary chain in Denver for taking part in an illegal practice called “looping,” it’s smart for dispensaries to track daily sales as well. A good point-of-sale (POS) system will automate this process for you and your staff. The Cova POS handles product conversions and will alert your staff if they are exceeding the daily purchase limits. These POS features aren’t just convenient -- they are necessary for protecting your business from steep fines or loss of license. Oklahoma dispensary owners have to pay taxes like any other legal business. The state enacted a 7 percent medical marijuana tax, in addition to a 4.5 percent state retail tax, plus a city tax up to 3.4 percent depending on location. Unlike many other legal states, Oklahoma did not opt for an excise tax on wholesale transactions between producers and retailers. It’s up to the business owner to collect taxes from each purchase and report the remitted taxes every month. 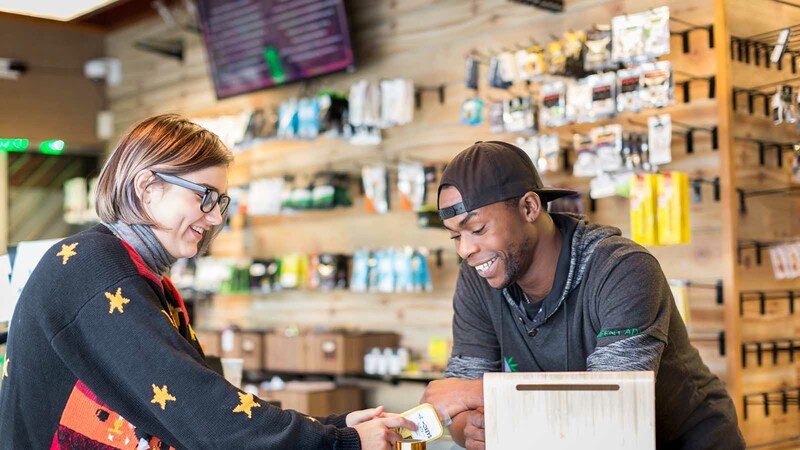 Cova’s POS system calculates the tax on all cannabis purchases and includes that information in its OMMA reports, avoiding tax reporting errors. The road to medical cannabis in Oklahoma is quite rocky. The state’s Department of Health (DoH) issued multiple and significant emergency rule changes during public meetings. In one meeting the state decided dispensaries could no longer sell “smokable” cannabis in the form of flower or joints, only to revoke that emergency rule change a few meetings later. As a medical cannabis dispensary owner, the onus is on you to stay up-to-date on the rules that affect your business. Know when DoH meetings are scheduled so you can prepare. Partner with a technology company that automatically updates their software as rules change. Avoiding costly compliance mistakes requires effort and help. If you own a medical cannabis dispensary in Oklahoma, there are ways to make your life a little easier. Request a demo to learn how Cova can help you meet your dispensary compliance requirements. Make it Count: Why Auditing & Inventory Counting is so Crucial at Your Dispensary?